← What Did I Learn Today, During and After Presentation? the discovery of something else along the way. There’s still a lot more to say about yesterday’s results. Is what ATLAS and CMS are detecting a real signal, or not, and what might make us nervous or confident about it? What are the implications if it really is a signal of a new particle? How confident can we be that it is a Higgs particle? How much evidence is there that it is of Standard Model type? I will write an article about these issues soon. 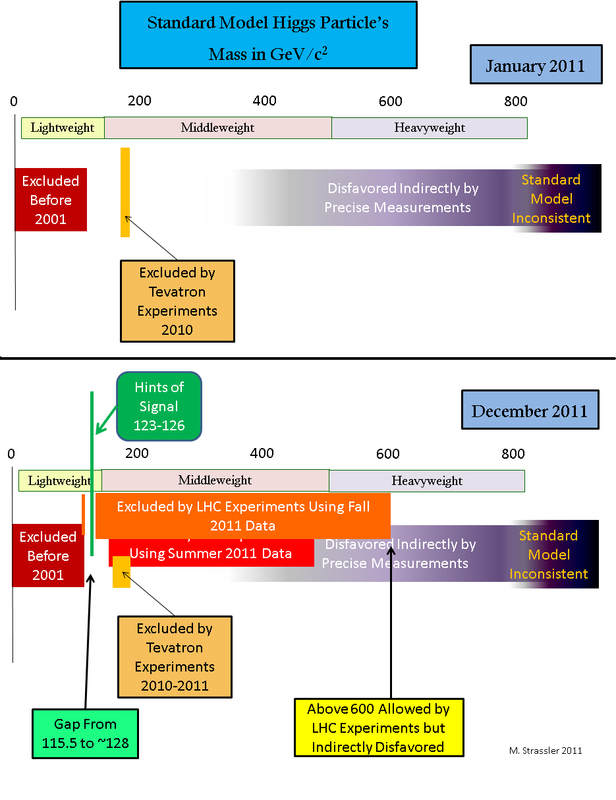 But there’s still a tremendous amount of work left (even for a theorist) to do to help plan for LHC in 2012, and to help assure analysis of the fall 2011 data is thorough. During the rest of my stay at CERN I will be working hard on that! However, I would be deeply remiss if I did not follow up on yesterday’s flurry of Higgs discussion by stepping back and reminding you what has happened here. I have nothing to say except: Wow. Wow. You’re amazing. I feel so privileged to be a witness to what you’ve done. The rest of us — other particle physicists, scientists everywhere, and the public — owe you a long and deafening round of applause. May history always remember what you achieved this year. And we also wish you the very best in 2012; may it be even more successful and historic than 2011. The search by the ATLAS and CMS experiments for the Standard Model Higgs particle made astonishing progress in 2011, leaving all eyes on the tiny remaining gap (115.5 to about 128 GeV) and the hint of a signal around 125 GeV. Well said, professor! And thank you for your great blog. Nice post. You should take a bow yourself for your excellent blog. I’ve learned a lot here. Here’s a half-humerous question: When will it be appropriate to replace the theoretical Higgs detection pictured on your front page with one of the real ones? Happy holidays. There is something wrong in this system where (at least on this side of the Atlantic) theorists doing hard, useful calculations are not getting jobs and nobody ever hears about them. How many model builders does one need? The other extreme may be Germany, which is firmly in the hand of the multi-loop/multi-leg mafia and where much less speculative or creative work is done by theorists (nowadays, I should add! before WW2 Germany certainly had the crazy model builders, whose models even turned out to be right). How about a healthy mix?! @ Peter Pan, Germany already has excellent theorists – Hans Peter Nilles, Arthur Hebecker, Dieter Luest, Ralph Blumenhagen, Timo Weigand, Michael Ratz just to name a few. Mark — your distinction between theorists and theorists was invented by theorists. The theorists Peter Pan is talking about are also theorists. @ Mark: Sure, Germany has some good people not doing multi loop calculations. But compare their creativity and influence to their American (ie working in the US) colleagues. If you want some names, how about Weinberg, Arkani-Hamed, Maldacena, Susskind, Witten… Who came up with extra dimensions, technicolor, little higgs, susy etc? For me, the most influential German hep-ph/hep-th physicist (working in Germany in the last 3 decades) in terms of creativity was Julius Wess. Anyways, my point was to have a healthy mix! Matt’s unfair but realistic description of “theoretical physicists that you never hear about” just reminded me of this issue, and I believe that the communities in the US or in Germany should be aware of this and discuss it.